or VISIT AT 3 E ARMY ST, WATER ST DISTRICT OF HENDERSON! 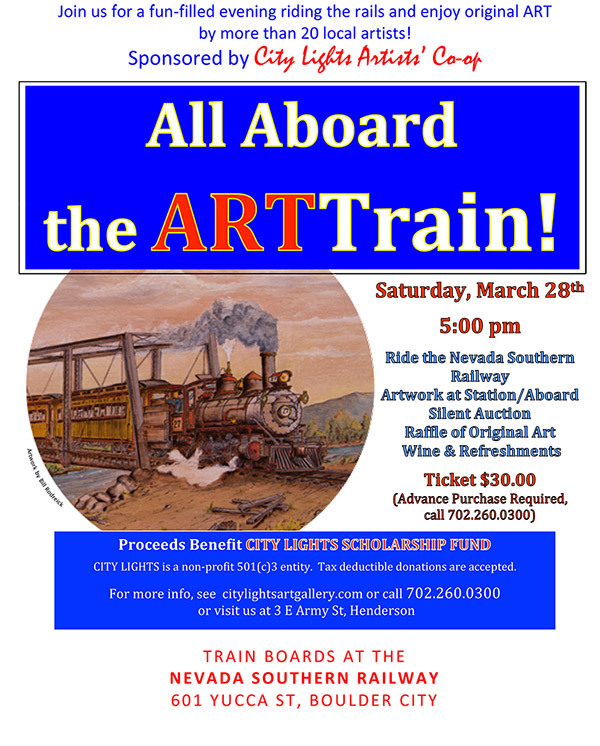 Experience an unforgettable evening as you take a slow run on the Nevada Southern Railway’s Boulder Branch Line while appreciating the artwork of 20 local artists. City Lights Art Gallery invites you to join us on this journey to enjoy the setting sun over the desert in five open air or closed heated/air-conditioned Pullman cars. The train leaves from Boulder City at 5pm. Study the original artwork at the station and on the train … all created by our Co-op members. A silent art auction is planned along with a raffle that includes an original piece by wood-burning artist, Bill Rodreick valued at $500. Get there early if you’d like to explore the rail yard and the State Railroad Museum or take more time with the art display. Tickets are $30.00 each and include the train ride, wine and hors d’oeuvres. Tickets may be purchased at City Lights Art Gallery, 3 East Army, Henderson NV or by calling the gallery at 702.260.0300. Space is limited, so please get your tickets early. See our website, www.citylightsartgallery.com for more details. Proceeds benefit the City Lights Scholarship Fund for deserving art students! Established in 2003, City Lights Artists’ Co-op is now a non-profit 501(c) 3 entity. We fund scholarships and mini-grants awarded to local students with aspirations in the world of art. Tax-deductible donations are accepted.